Reporter Michael Kelly, an "embedded" American journalist with the United States Army's 3rd Infantry Division, has been killed along with a soldier after an accident in Iraq, US officials say. Kelly, who was on an assignment for current events magazine the Atlantic Monthly, died on Thursday in an accident that involved a Humvee military vehicle. 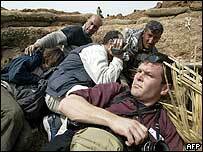 He is the first US journalist and the first "embedded" reporter to be killed in the current conflict. US officials said the circumstances and cause of the accident are under investigation. The identity of the dead US soldier has not yet been released. 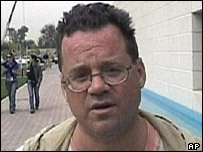 Kelly's death adds to the growing list of journalists killed and injured while covering the attack on Iraq by US and British forces. The 46-year-old US reporter, who also wrote for the Washington Post, was known as a fiery columnist who had a conservative political outlook. In a column penned in February he wrote: "To march against the war is not to give peace a chance. It is to give tyranny a chance. "It is to give the Iraqi nuke a chance. It is to give the next terrorist mass murder a chance." John Fox Sullivan, president and group publisher of Atlantic Media, said: "Some people knew Michael as one of this country's most gifted writers and editors. "Many knew him as a fiery columnist. I knew him as an honest, funny, caring and even gentle human being." Pentagon chief spokeswoman Victoria Clarke said Kelly was a phenomenal journalist, one of several reporters who had died in Iraq trying to tell an important story. Other journalists have also died in the current conflict, including BBC cameraman Kaveh Golestan and ITN reporter Terry Lloyd. Australian cameraman Paul Moran and Channel 4 News correspondent Gaby Rado have also died while working in Iraq, bringing the total number of journalists who have died to five. In addition, two of Terry Lloyd's co-workers are still missing and two Australian journalists are under house arrest in Baghdad.